Wanamingos - my girlfriend just calls them “slap monsters”... These weird, slippery aliens only appear in Fallout 2. Okay, okay, they aren't aliens. They are mutated creatures created by a “tailored” FEV virus for the purpose of warfare. Fallout 2 Wanamingos are very difficult to deal with as they often attack in large groups and have a high laser resistance. The name Wanamingo comes from the Great Wanamingo mine in Redding, California. The citizens of Redding simply referred to them as wanamingos because they didn't know what else to call them. The citizens didn't know much about the wanamingos at all. Most people did think the wanamingos were some kind of aliens. The one thing everyone did know was that they were deadly. The Chosen One might encounter them in the wastes, usually after visiting Redding. However, the Chosen One's main interaction with these creatures occurred in the Wanamingo mine, which was owned by Ascorti, Redding's mayer. Ascorti will offer the Chosen One the deed to the Great Wanamingo Mine for 1,000 caps. However, if you enter the mine, clear all the wanamingos including the Wanamingo Queen, Ascorti will offer to buy the deed back from you. Not only is the Wanamingo Queen very tough, but the Chosen One must battle through multiple layouts of the cavernous Great Wanamingo Mine against slappy wanamingos in order to reach the disgusting den where the queen protects her eggs. Be sure to destroy the eggs along with the other wanamingos! This Wanamingo Queen is the only one to exist in the year 2241, therefore if the Chosen One destroys this Wanamingo Nest, it is thought that all the remaining wanamingos will eventually die out and the mutated race will become extinct well before Caesar starts to form his legion. 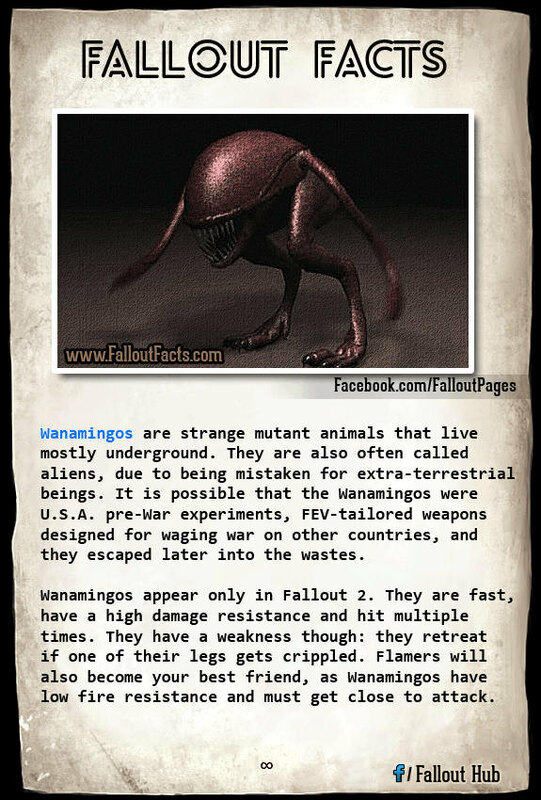 There were *severely* mutated wanamingos rumored to be in existence near New Vegas, but aside from some fantastical drawings of these imagined creatures, there have been no confirmed sightings. These were actually conceptualized for inclusion in Fallout 3, but were cut from the final version of the game. Will the wanamingos make a comeback in Fallout 4? This author has seen certain leaked documents that indicate this is a big possibility! And that's all we've got on the Fallout 2 Wanamingo. Hope you enjoyed the reading. Stay tuned for more cool Fallout Facts coming up soon... Or get the updates via email below.